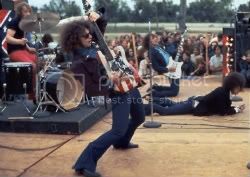 Though raw and sometimes slapdash, MC5: A True Testimonial goes a long way in explaining why that happened, most notably through the raw power of the band's music and the fiery passion that was bound with its image. Like the band itself, the movie is loud and noisy and undeniably eye-catching. But like them, too, it fatally can't see beyond the immediate to realize there's a better way of making its point then simply shouting louder than anyone else. A riveting, all-elbows- and-knuckles documentary about the proto-punk warriors known as the MC5. A vivid evocation of a moment when even the ugliest guitar feedback could be taken as a serious political statement. Bassist Michael Davis, way Lynchian on his desert land, and drummer Dennis Thompson, who brandishes a rifle at one point, provide jolts of pathos and aggression that remind us these were never art-school pretenders to the skids. ...captures the gritty charisma of Detroit as it informed the quirky and colorful personalities of a band that many fans still remember today. The flick is pretty straight forward and somewhat boring, but it's nice to see the attempt. A success in that it might help introduce the group to Gens X and Y.
Intelligently combines rarely shown film, TV news, home footage, stills and interviews in a complete package. Like other commercial flops such as the Velvet Underground and the Stooges, the band's influence continues. This definitive documentary shows us why. This was really great. A different view on hippie revolutionary lifestyle a lot of America didn't see. Live performances provided by F.B.I. Surveillance were some of the best ever recorded on any band. Finally, a documentary showing a better understanding and great insight to the controversial band that changed rock and roll. The sooner they quit delaying the release, the better for everyone. Required viewing for all fans of music.